We are very happy to share that we have finally convinced JBIMS Mumbai to officially share a verified placement report in our standard format! JBIMS is one of the legendary business schools of India which has thrown up leaders like Noshir Kaka (Mckinsey & Co.), Nitin Paranjape (HUL), Chanda Kochar (ICICI Bank), Mani Ratnam (Film Director ), Uday Kotak (Kotak), Vinita Bali (Brittania), Siddharth Roy Kapur (UTV), Sanjay Lalbhai (Arvind), Harish Manwani (Unilever), Atul Khosla (Oliver Wyman) and the list goes on. Few business schools in India can boast of producing so many industry stalwarts. 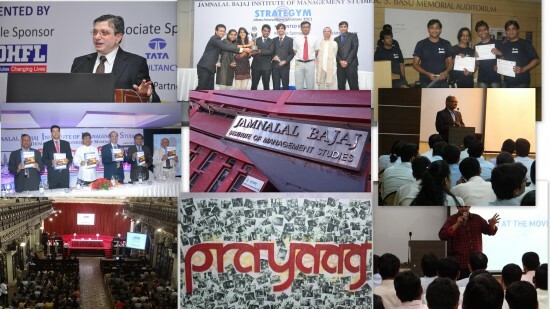 JBIMS had a location advantage for decades being in the commercial district of India’s capital of Finance and Industry – Mumbai (erstwhile Bombay). JBIMS continues to reap dividends owing to this extra-ordinarily rich legacy. As you will see in the report below, there are some marquee names like Unilever, Procter & Gamble, Citibank, Standard Chartered Bank, HSBC etc. who will almost always recruit at JBIMS. You will also see Mckinsey & Co. recruiting during final placements. One also needs to understand that JBIMS has only 120 seats. JBIMS does not require the presence of a very high number of recruiters because there aren’t enough people left to be placed! It is also one of the toughest schools to get into (especially as an open category candidate) and hence the ones who make it are really valued by recruiters. 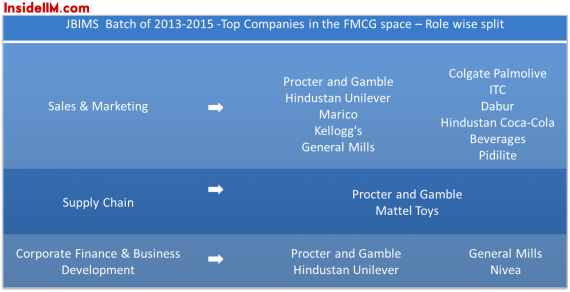 FMCG and Pharma sectors stand out this season. 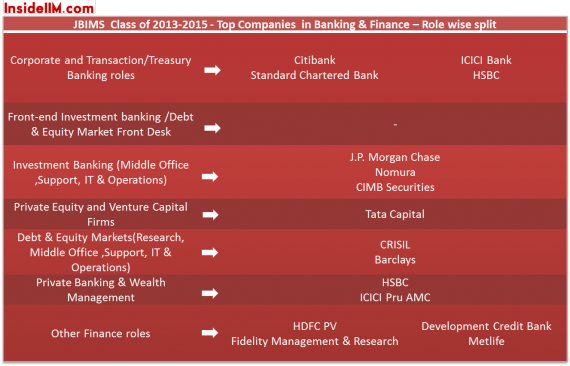 In the context of a small class of 120, the number of finance roles is also quite impressive. There is no dearth of option in the General Management space either. The report has 58 of the 71 companies that made offers. We would like to thank the JBIMS Placement Committee for their co-operation. In case you wish to point out anomalies in the report, do write in to us at editor(at)insideiim(dot)com. We will try to clarify it with the placement committee. Anonymity will be ensured. are the figures accurate or it is inflated ?????????? Case Study Method – A Way of Life ?